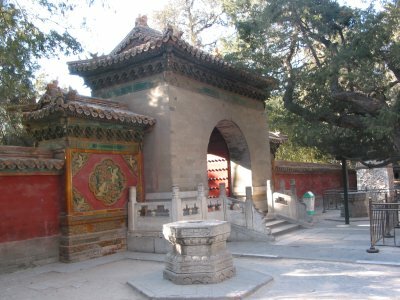 The Gate of Heaven's Primacy (Tianyi men) is located inside the Imperial Garden (Yuhua yuan) as the south gate of the Hall of Imperial Peace (Qin'an dian). During the Ming dynasty (1368-1644), the Jiajing Emperor (1522-1566) added walls to form a courtyard of the hall, and named the door of the courtyard "Gate of Heaven's Primacy". "Heaven's primacy" indicates the northern stars and is associated with water. This gate is built up with clay bricks that is rarely seen in the Forbidden City, for they are refractory and agree with the green and quiet surroundings.